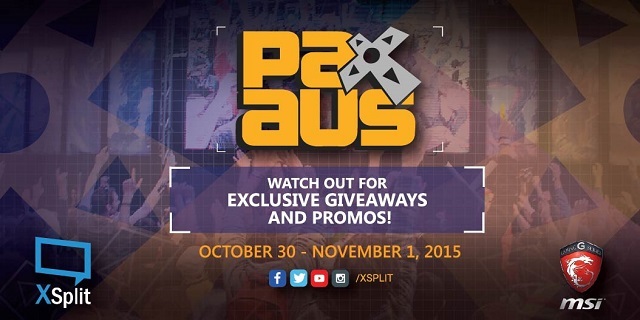 Australia is the first international region to have PAX events outside of the United States. The Australian PAX team have done an exceptional work to make its scene grow, and this year will be the 3rd annual PAX Aus event to date. We’ve been quite active attending several international events including PAX East, PAX Prime in the U.S. and as well as a few events that were held across U.K. and other regions in Europe. We will not be having a booth or co-exhibiting with other companies at PAX Aus, but we’re happy to announce that our Community Manager Kevin “@BurnoutFighter” Kim will be at the venue, checking out some of the great Australian gaming industry leaders and the community of online content creators. Kevin will be wearing the ever so cool XSplit T-shirt, and if you can spot him on the floor during the event weekend, take a photo with him then upload it to Twitter or Instagram tagging @XSplit, @BurnoutFighter and @PAXAus then you can win an XSplit Premium license code from him! Also on Sunday, 12:30pm AEST (Australian Eastern Standard Time), popular YouTube content creator Dan aka “Silentc0re” will be at the ‘Being a Gaming YouTuber in Australia’ panel in the ‘Main Theatre’ of the PAX Aus venue. Silentc0re has been to many international gaming conventions and have been active as our brand ambassador for XSplit and is willing to share his tips on creating YouTube content with the use of the XSplit software. If you are a fan of Silentc0re’s YouTube channel, or would just like to improve on your content creation skills, feel free to ask any questions regarding the XSplit features that he utilizes in creating his content.